Important Factors In Choosing The Right Safe! No matter what needs protection, a safe is the final line of defense. And as the final line of defense, it must be able to withstand all kinds of attacks – from burglars, from fire, from smoke and from water. Of course, safes vary quite a bit in their ability to deliver on this protection, and some safes are much better at it than others. 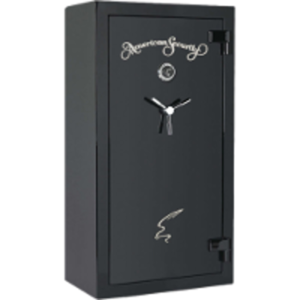 Furthermore, safes tend to be designed to protect certain valuables, including guns, jewelry, paper documents and so on. The goal for a buyer, then, is to match up what they need to secure with a safe that can provide that security. Gun safe? High Security safes / Jewelry safe? Commercial safe? These questions are important in the decision-making process. Gun safes are built with racks and clips that help keep long rifles and pistols secured without scraping up against each other. High security jewelry safes are built with cabinets or shelves that allow for easy organization and accessibility, so an owner can still use their jewelry while keeping it secure. 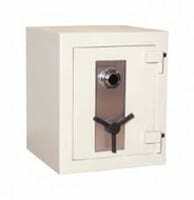 High security commercial safes offer an equal level of security and are particularly formidable against burglary. It makes no sense to store guns in a jewelry safe, or family photos in a commercial safe, so narrow down the search in this way first. What level of burglary protection? Safes are, first and foremost, about security. And in this instance, security means delaying a concerted attack by a burglar. 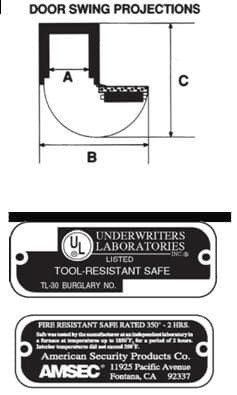 Underwriters Laboratory (UL) is one of the most respected organization for testing safe security, and employs the best safe crackers in the world. They assign ratings to safes according to their ability to withstand an attack using tools. For example, an RSC (or residential security container) means that the safe can resist five minutes of attack using tools. This scales up to UL TL-30×6, which means all six sides of the safe should be able to deflect attack for half an hour. What about fire protection? A close second to burglar protection is fire resistance, as safes are often relied on to protect sensitive photos and documents from fire. Guns also require extended defense from fire, or they will be ruined by the heat. UL and Intertek’s Electrical Testing Lab (ETL) both rate safes for their fire defense, and this rating is usually represented by a temperature and a time. So, for example, a fire rating may be 1 hour at 1,800 degrees. This means that the safe’s interior will not exceed a temperature of 350 degrees Fahrenheit for up to an hour when exposed to a fire of 1,800 degrees Fahrenheit. This will keep paper and guns safe, but if data or photos need to be protected, then a safe that maintains a lower interior temperature will be needed. It’s usually necessary to target advanced fire protection as a design feature, because it won’t be built into most standard safes. What kind of locking mechanism is best? Mechanical and electronic locks are the most common, and they each offer their own benefits. Mechanical locks are the most reliable on the market, while electronic locks are more accessible, granting faster entry. If quick access is needed, such as in the case for gun safes intended for home defense, electronic locks make the most sense. Otherwise, a mechanical lock is usually the preferred option. Some higher security safes use both, so if one is defeated, there is still a second layer of security. How big does it need to be? Safe costs scale up as the size scales up. It makes sense, then, that a buyer should get a safe that is only just big enough for their needs. However, if a buyer anticipates adding more to their safe, then going a bit bigger will likely be the most economical option. This is particularly true for people buying a gun safe, as firearms take up a lot of space. It’s easy to fill up a gun safe and still have a need for more room. These are the basics when it comes to selecting a safe for home or business security. In truth, it takes time and research to find the perfect safe, and it’s a decision that shouldn’t be made lightly. In a perfect world, a safe would never be needed, but if the worst does happen, it better be a safe that can be relied on.